Eminent script writer, lyricist, poet and Chairman of IPRS, Mr. JavedAkhtar was recognized and awarded with the inaugural Indian Music Industry “PERSON OF THE YEAR” award. In a glittering function organized by the IMI during the first “DIALOGUE- Indian Music Conclave” organized by the IMI which is the apex Indian Music Industry body, Mr. Akhtar was presented with the award by Mr. ShridharSubramaniam President of Sony Music India and Chairman of IMI and by Seymour Stein, Co-founder/ Chairman Sire Records and VP Warner Bros Records. An audio-visual which was played during the presentation contained messages from personalities such as Oscar winner and renowned music maestro AR Rahman, Filmmaker Karan Johar etc., demonstrated the respect with which Mr. Akhtar is viewed across the film and music industry. Stakeholders in the music sector such as VikramMehra, MD Saregama, DevrajSanyal MD & CEO Universal Music Group India and South Asia spoke of the immense respect that MrJavedAkhtar has gathered the industry by ensuring that the creator and music business communities build bridges in an effort to work together for the success and betterment of the industry and for his role in ensuring that authors, composers settle their long standing with the music industry which had been festering for years. 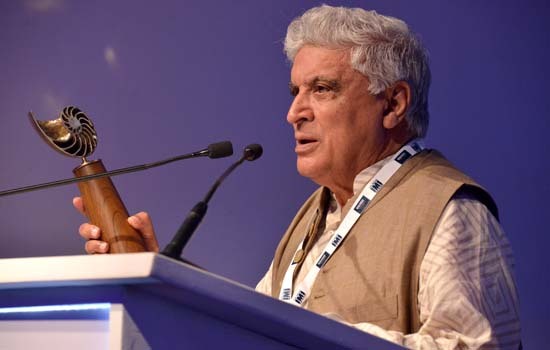 In his address to the conference on receiving the award, MrJavedAkhtarsaid, that the creator was an indispensable part of the music industry and the soft power of creators could be a critical part of the strength of the music industry as it deals with the serious challenges posed by technology. He said, “this award is not only recognition of me, it is recognition for all stakeholders in the Industry- of the extremely positive and mature fashion in which the industry now conducts and views itself”. DevrajSanyal MD & CEO of Universal Music Group, India and South Asia said, “Javed Saab’s exemplary leadership and even handed approach to all stakeholders has brought this industry to an extremely positive point - something we have not seen for quite some time now. IMI (‘Indian Music Industry”) is the apex music industry association and an affiliate of IFPI (International federation of Phonogram Industries) and the premier recorded music industry body in India. IPRS is India’s only Registered Copyright Society authorized to carry on the business and granting of licenses in respect of literary works and musical works including when these works are exploited as part of sound recordings or cinematograph films.